Korando Heating & Cooling is proud to serve the Chester community! Please call us today at 618-826-2151 to consult with our home comfort specialist. About Chester, IL - Happy to be your hometown Heating & Air Conditioning Contractor! Chester is a charming and family-friendly Illinois town with tons of character and amazing residents. People love living here, and it shows. This Randolph County river town has a love and respect for the Mighty Mississippi. In1844, the steamboat named Bellair ran into town and destroyed several buildings. There are thousands of local stories to hear all about the lovely river and all of its glorious power. Never mind that it has been a source of local industry and transportation for centuries. Hot summers swimming and splashing, boating and fishing are fond memories for many local kids, as well. The river and the town are really as one. Chester was a preferred place to stop for both the river men as well as the boat travelers. Charles Dickens and Mark Twain are both said to have stopped in and stayed a while. 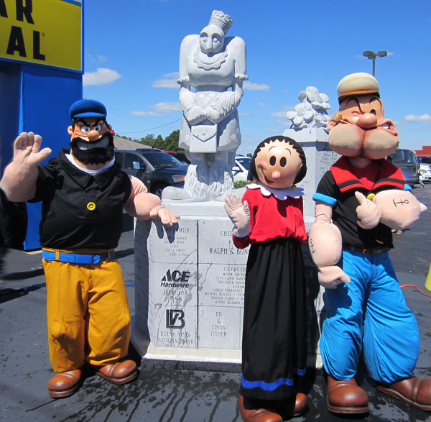 However, the town’s greatest claim to fame may be that it is considered the birthplace of the cartoon character, Popeye. The sailor and his friends are commemorated with statues and art all over town. It is clearly a source of pride for locals. The seasonal weather means that it might be too cold in the winter, but should you find yourself in Chester in the spring or summer, you must check out the Popeye trail around town. It is a great family activity. Every September, as the weather cools and the leaves change, the town holds its annual Popeye Picnic. It is a wonderful time for locals to spend time in fellowship and friendship and is a local favorite for kids and adults alike. There are booths, food, games and more and no one leaves with an empty belly. But, that is only one of many community activities that the town presents each year. It is not a big and fancy city but there could simply be no greater place to raise kids than in this area.